Dental implants are human-made replacements for the root of a tooth. If a patient has broken or missing teeth due to injury, periodontal disease, decay, or congenital defects, a dental implant can replace a single tooth, several teeth, or the entire upper or lower jawline. 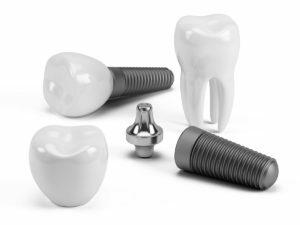 Most modern dental implants are made of titanium and look similar in size and shape to the natural root of a tooth. Titanium is very strong and durable, and this material can fuse to the cells within the bone of your jaw over time. The fusing process is called osseointegration, which makes the implant even stronger. When dentists place an implant in the upper or lower jaw, they often take CT scans, or three-dimensional images of the jaw, to find existing bone and its depth along with locations of nerves and sinuses. This process helps the dentist make sure that the implant is placed properly without causing unnecessary pain or complications. 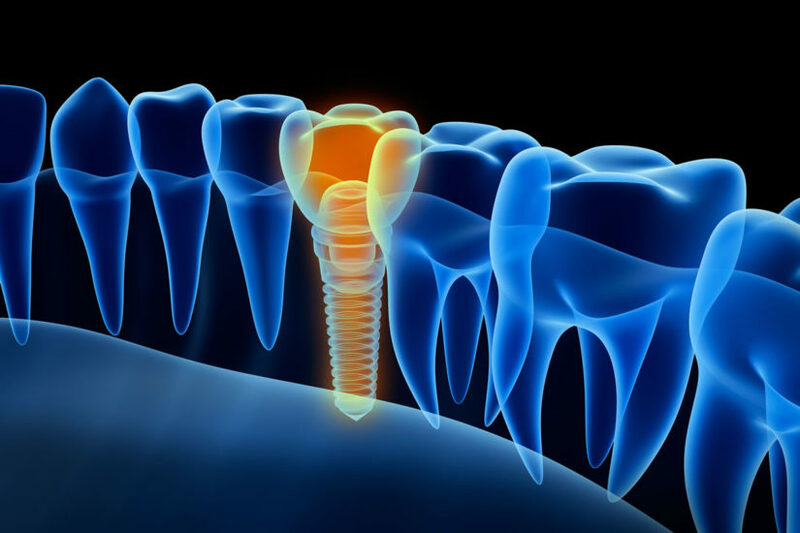 When placing the implant, modern technology allows for exact positioning and safety during the surgical procedure, such as surgical guides and computer-assisted dental planning software – ensuring that the implant is placed safely and correctly. If your jawline doesn’t contain enough bone, your dentist may need to add bone grafting material to ensure that the implant has something to hold on to, keeping it firmly in place. Bone loss can occur as the result of previous dental work, infection, or other health conditions. Bone grafting materials are made of freeze-dried, mineralized bone that transforms into new bone as it heals. If your sinus area needs bone grafting, the procedure is called sinus augmentation. The healing time for a dental implant procedure is typically at least three weeks. Some patients’ implant procedures will take months to heal, although this is less common and usually caused by an underlying medical condition or tobacco use. Total healing time also depends on the condition of the bone in your jaw. Sinus or jaw augmentation procedures require additional healing time, so it could take longer before you have the crown or bridge placed in your mouth. After the implant has healed and shows signs of osseointegration, your dentist can attach an abutment. An abutment is a connector built into or placed on top of the implant, providing something for the crown or bridge to attach to within your mouth. After attaching the abutment, your dentist will be able to take additional imprints and imaging to create and place the permanent tooth. Some dentists are now offering implants as Teeth-in-a-Day. Depending on the nature of the tooth being replaced, it’s now possible to place an implant along with the abutment and crown in a single sitting. There are some constraints to this procedure, as the implant wouldn’t be able to withstand strong chewing force for several weeks or longer, but for many people, this is a ideal option. Bone loss can occur in patients with osteoporosis, poor circulation, or other health factors that impact healing. But one of the most common reasons is from the loss of a tooth. When a tooth is no longer present and receiving contact and use from your bite and chewing, the bone where the tooth had been begins to recede. An implant can halt and even reverse bone loss by stimulating the bone by re-involving the formerly missing tooth in your bite and chewing. If you’re already missing a tooth, you’re probably already experiencing bone loss. In many cases this can be overcome, but the longer you wait to install an implant, the greater the bone loss and the greater the likelihood that an implant may no longer be viable. You could also experience bone loss if the gums and other tissue become infected from poor dental hygiene and care. Regular visits to your dentist and adequate brushing can reduce the risk of infection. Titanium has a 95 percent success rate for bone fusing and a healthy, functioning implant for at least 10 years. In most cases, implants will last much longer and most dentists expect them to last for the lifetime of the patient. As with most things, success is dependent on care and maintenance. Regular dental check ups are just as important for implants as they are for your natural teeth. Your dental team will inspect your whole mouth, including implants, because if your crown isn’t adjusted to your bite properly, the force could lead to bone loss and damage to the implant. On a maladjusted implant, heavy force can bend or shift the implant sideways through constant chewing, and even the strongest metal can’t withstand the force from the strength of your jaw. So, while implants are permanent, they don’t mean you can stop visiting the dentist. Dental implants come with a number of benefits. They are the next best thing to natural teeth, offering strength and stability that restores a lost or damaged tooth. When placed correctly, the implant will fuse with your bone and create a tooth that fits, feels, and looks like a natural tooth. With proper care, a dental implant can last for many years without failing or causing other issues. In fact, your implant could last for your entire lifetime. It may require some periodic adjustments but typically won’t need replacement. A dental implant can also protect the healthy bone within your jaw. Leaving spaces due to tooth loss or decay can lead to additional health concerns, such as additional bone loss, but a dental implant procedure can actually preserve and stimulate your bone to keep growing, preventing loss over time. When you don’t have enough teeth in your mouth, your face might look sunken and unnatural, and adding a dental implant can restore the shape of your face and mouth. Alternatives to dental implants include bridges and dentures, although these aren’t as comfortable for most patients. People often complain about the fit of dentures, which make it harder to eat, speak, or even smile naturally. 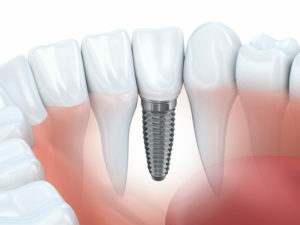 In recent years, the average cost of a dental implant procedure is between $3,000 and $4,500 for an implant and crown. But here in Canada, advances in technology are making implants more affordable by helping to bring dental implant costs down significantly at some providers. Some dental insurance companies also offer coverage for a dental implant or a portion of the implant procedure, although it depends on your plan and policy. Learn more about dental implants and find a dental implant provider for a consultation in your area.